The goal with Colonial Solar House is to supply all of its energy needs from solar photovoltaic (PV) modules. Solar modules create electricity directly from sunlight, with no moving parts. They are truly a high-tech source of electricity. Colonial Solar House produces much more energy than it needs in the summer and much less than it needs in the winter (remember, the geothermal heating system runs on electricity). My system does not store the excess summer energy; instead, it’s fed into the electrical grid. Ameren gives me a credit for this energy, which I can use later when I need it. This billing arrangement is called net metering. I installed my solar PV system in two stages. I completed the garage in May 2013 and the house in July 2013. I’ll discuss these separately, because they were rather different projects. 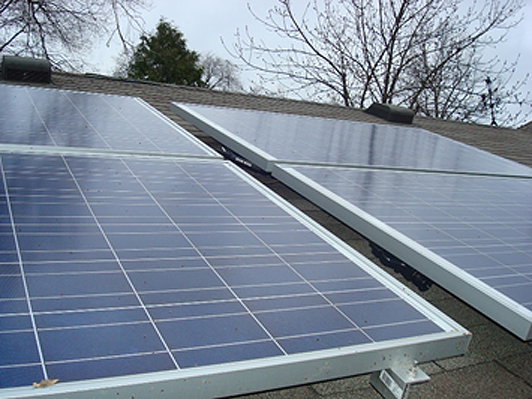 The garage PV system was a do-it-yourself job, because professional installation would have been quite expensive. In the solar PV industry, contractors quote prices in dollars per installed watt of power, with $4-5/watt a typical rate. For my 6-kilowatt system, the installed cost would have been over $24,000. Yes, there is a 30% federal tax credit and a 25% state rebate, but I wanted to bring the cost down further. For the garage, the answer I came up with was to do it myself. This was a leap of faith on my part. Although I am a physicist, I am a theoretical physicist, which means that I am more comfortable working with numbers and equations than with a hammer and a drill. In fact, I would rate myself well below average in handiness. What convinced me that I could do the project was seeing Phil Krein’s do-it-yourself project, installed in November 2012. It didn’t look to be beyond my meager abilities. I got lots of helpful advice from all sorts of people, including Phil Krein and my brother Mark (who inherited all the handiness genes from our father). The person who helped me the most was John Hammons, owner of the online company Oy Not Solar. He helped me to design the system, sold me all the equipment I needed, and answered my myriad of questions about installation. He is genuinely a nice guy and never tired of my phone calls. Here are some photos of the finished product. I was fortunate that my garage is only partially shaded. I was unfortunate that my garage has a pyramid-shaped roof, called a hip roof in the building trade. This made the PV array rather complicated and exercised my abilities in geometry. The solar PV array on the garage. The first photo shows the modules on the west and south faces; the second photo shows the modules on the south and east faces. There are also two modules on a shed situated to the south of the garage, shown in a photo below. One of the reasons the project is doable even by a klutz like me is that I didn’t have to do any electrical work. The solar PV modules produce direct current (DC), but the electrical grid uses alternating current (AC), so the system requires an inverter to convert DC to AC. The modules I used come with microinverters already installed on each module. The electrical work amounted to plugging one module into the next, which even I could do. The microinverters don’t produce any voltage until the system is connected to the grid, which makes them inherently safe to work with. I hired Waters Electric to do the final connection to the grid, but even that is pretty straightforward (at least for an electrician). The other beautiful thing about microinverters is that the energy output of each PV module is independent; if one module is fully or partially shaded, it does not affect the other modules. That is crucial for my situation, because I live in a part of town with mature trees, and some shading is unavoidable. There are now quite a few of these AC modules on the market. How do you know which brand to choose? I don’t know, really. Here was my decision-making process: First, I wanted to have SolarBridge microinverters, which were developed at the University of Illinois (by Phil Krein, mentioned above, and Pat Chapman). There are only a few PV module manufacturers that use SolarBridge microinverters and that also sell directly to the public (some sell only to professional installers). I chose BenQ 255-watt AC modules, made in Taiwan by the company AUO, which are similar to the 240-watt modules that Phil Krein used. They carry a 25-year warranty on both the module and the microinverter. BenQ 255-watt AC solar module. Attached to the back is a SolarBridge microinverter. I referred to this as a do-it-yourself project, but you can’t really do everything yourself. Along with all the helpful advice I got, I needed help mounting the modules, which are bulky and weigh 50 pounds each. Installing the racking system that supports the modules is not hard to do by yourself, however. I used the Unirac Solar Mount racking system, and reading the online instruction manual and asking a few questions was enough for me to install it properly. Jim and Tim Fritchie help me install the PV modules on the garage. The modules are clamped to rails that are attached to the roof with brackets called L-feet. Ty Newell, the owner of Equinox House, helped me to install the two modules on the shed behind the garage and supplied much advice, encouragement, and levity. Sorry, I don't have a single photo of myself doing any work! You won’t be surprised to hear that the ideal direction to face a solar PV module is south. You’ll notice that most of the modules on my garage face east or west. That is not ideal, but it is not so bad either. In Central Illinois, these will produce about 20% less energy over the course of a year compared with south facing modules. As for the angle of the south-facing modules, the ideal is the local latitude (40 degrees in Champaign), but 30 degrees (the pitch of my roof) is almost as good. You can explore the energy output of various directions and angles on PVWatts. There are 24 modules in total on the garage and shed, which makes it nominally a 6-kilowatt system. If you take into account that most modules face east or west, it is really a 5-kilowatt system. That’s enough to provide all of our electricity with the exception of the geothermal system. For that, we need more modules. Let’s take a look at the roof of the house. The first problem I encountered was a big one: an enormous silver maple shades the entire southern roof of the house. I loved this tree, but if I wanted more PV modules, it had to be removed. I realized that removing the tree would mean releasing carbon dioxide into the atmosphere as it decayed. However, I estimated that the same amount of carbon dioxide emission from a power plant would be displaced by the electricity generated from the house PV system in just four years. Since Colonial Solar House will be solar-powered for 25 years and hopefully beyond, this was a net gain for the environment. The huge silver maple was removed by Michael Poor in the space of just one morning. As it turned out, it had extensive rotting inside, so it may be fortuitous that we removed it. We replaced the tree with a young paperbark maple that will not grow high enough to shade the roof of the house. The second problem: I was terrified to go up on the roof of my two story house. This was not going to be a do-it-yourself job, but I still hoped to do it cheaper than a professional installer. Ty Newell (see photo above) suggested I hire New Prairie Construction to work with me on the project. New Prairie Construction had done an addition on my house in 2011, so I was familiar with the company’s excellent work. I designed the solar PV array for the house, again with the help of John Hammons of Oy Not Solar, and he again sold me all the equipment I needed. This was going to be a bigger job than the garage: there are 36 modules on the house, for a total of 60 modules on the house, garage, and shed combined. The New Prairie crew members erected scaffolding for ease of access to the roof and tied safety lines around the chimney for each of us to use. They worked much more quickly than me, but I helped as much as I could. We completed the project in 4 days, including a day and a half spent moving plumbing, attic, and bath vents to make way for the solar modules. More importantly, we installed the system (including the final electrical connection to the grid, again by Waters Electric) for a price of about $3/watt—a much lower rate than a professional installer. This is before the 30% federal tax credit and the 25% state rebate. The house solar PV array, using the same BenQ modules as on the garage. The modules on the main roof face south, and the modules on the addition face west. The New Prairie Construction team at work. The crew was led by Nick Gordon, wearing the green shirt. That's me with the red St. Louis Cardinals cap. With this project completed, the New Prairie crew members are essentially professional installers, and I am hopeful that they will do more projects at a reasonable cost. I would also like to see other local construction companies get involved in solar PV installation. My total system is nominally 15 kilowatts, but with the east and west facing modules, it is really about 13 kilowatts. My calculations indicate that this should be enough to supply the entire energy needs of the house. We shall see. I have a monitoring system that allows me to see the energy output of individual modules online and I enjoy checking in every once in a while to see how the system is doing. A snapshot of the monitoring system at 11 a.m. on September 23, 2013. For orientation, south is at the top of the page. The cluster of modules to the left are on the house, the cluster to the right on the garage and shed. Each module shows its current wattage both numerically and by brightness. Because it is morning, all of the west-facing modules are producing less energy than the other modules. The prices for solar photovoltaic modules have come down so much in the past few years that this technology is primed for mass deployment. In Central Illinois, a solar photovoltaic system delivers electricity at the same cost as the local utility if it can be installed for about $3/watt. A do-it-yourself installation costs about $2.50/watt, and I was able to do an installation with New Prairie Construction for about $3/watt. Of course, I am not including my own labor in the cost. But wait, there’s more: if you act now (through 2016), there is a federal tax credit of 30% of the total cost of your solar PV system. There is also an Illinois rebate of 25% of the total cost (good through 2015). This year the state rebate is being done as a lottery. Let’s consider a 5 kW system, which would supply most if not all of a typical family’s electricity. If the system is installed at $3/watt, that’s $15,000, with a federal tax credit of $4,500 and a state rebate of $3,750 for a total cost of $6,750. This system would produce about $650 of electricity per year. That’s 9.6% annual return. The system is warrantied for 25 years, but will continue to produce beyond that. If we assume that the system is replaced after 25 years, the annual internal rate of return comes out to 8.3%, tax free. Remember that this does not take into account any increase in the cost of electricity. If you install as many solar photovoltaic modules as I have, there may be another cost that I have not yet mentioned. The National Electric Code limits the amount of solar electricity that you may feed into the grid, depending on the maximum current your main electric panel is rated for. Our house formerly had a 200 amp service; this could accommodate up to 7.68 kW of solar PV modules. In order to install the 15 kW of solar PV modules that we needed to get to zero net energy, we had to upgrade to a 400 amp service. In addition, we chose to have our electric utility line buried (along with our phone and cable lines), which was an additional expense. These lines used to hang over the garage, and it seemed like a good opportunity to get them out of the way. This was mostly a cosmetic choice, however; it is acceptable to have lines hanging over the solar PV modules, since they cast so little shadow. Also recall that I had an enormous tree removed, which is yet another expense.